La Montanara (168 Ludlow Street) opens it’s doors this evening and I was lucky enough to get a sneak peak last night. Formerly a poutine shop, this 20-seat Lower East Side spot is New York’s first pizzeria that will be serving fried pizza… and nothing but fried pizza (oh, and a few fried appetizers). 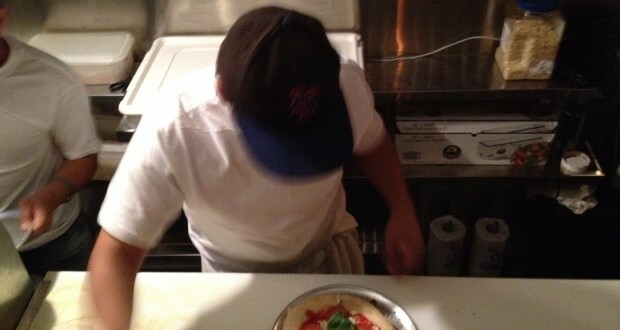 The man behind the concept is famed pizzaiolo Giulio Adriani who introduced the public to this specialty when it appeared on the menu at his other pizzeria: Forcella. Since then, the city has become obsessed with this style of pizza (known as the montanara), culminating in the opening of a shop where fried dough is the only way to go (note: potential marketing slogan). I’ll be the first to say, that I don’t love fried pizza. I don’t dislike it, but I’m far from ready to proclaim it the next big thing. That being said, La Montanara makes a pretty darn good pie. But I’m fine eating Neapolitan pies that aren’t prepared by deep frying the crust, tossing it in a pan, topping it and only then putting it in a wood fired oven. What was wrong with the way things used to be? One thing that La Montanara has going for it, is its location. In the heart of the Lower East Side this place will be packed on weekend evenings. One issue, however, is that they close at 2AM. What’s a twenty-something to eat when he stumbles out of the bar at 4AM? Sounds like prime fried pizza time to me. An extension of hours will most certainly be needed to capture the target market for this product. Another thing that La Montanara has going for it are its prices. Only one pie costs more than $8. Although the pies are much smaller than traditional Neapolitan pies, I believe that it’s a fair price point for what you’re getting, especially given the location. The problem is that the spot’s standout pie is its $12 offering — the Tartufo which features mozzarella, mushoms, ham, and truffle oil. I happen to love truffle oil, but boy is this pie truffle-y. Other offerings include a $10 Porchetta pizza sandwich which contains mozzarella, smoked mozzarella, and porchetta. It was good. And for $4 you can also grab some pizza strips with nutella and sugar. Mmmm. When all is said and done, La Montanara is an interesting concept with a simple menu featuring reasonably priced items. The New York pizza scene is reaching its saturation point which means people must come up with new spins on this quintessential food. Props to Giulio taking a stab with La Montanara. I can only hope it’s as successful as Forcella.